HAPPY BIRTHDAY - To My Darling Sister! 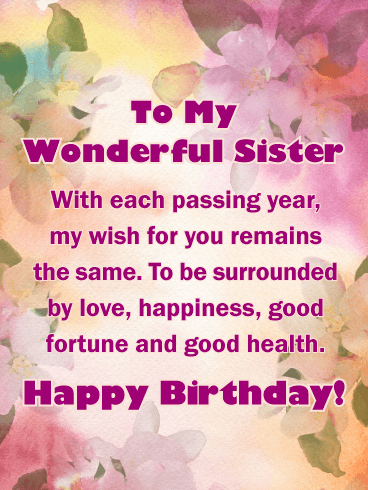 Sending you joyful birthday wishes and thanking you for being such a wonderful sister. I hope the year ahead brings you much success, lots of fun, and everything you are hoping for. Lovely pink hearts and swirls set the stage for this wonderful birthday card that was designed just for your sister! 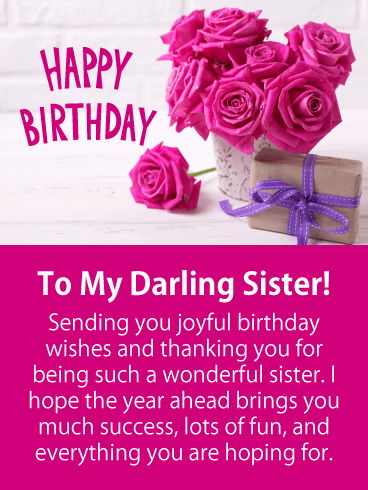 The message will surely touch your sister's heart when she reads that you are thanking her for all the love, care, and joy she has sent your way, and that you couldn't have asked for a better sister. Let her know how you feel and wish her an enjoyable day with this special pink heart birthday card today! Does your sister like spectacular sparkling dresses, the type a beautiful princess would wear? Is so, then this birthday card will capture her attention. It was designed with the most fabulous pink gown that will have your sister wishing she could actually wear it on her birthday. 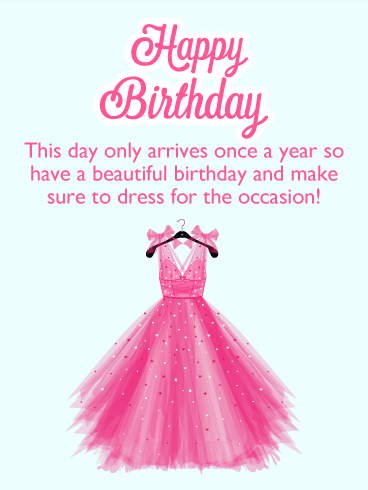 This greeting card is a great reminder that her birthday only arrives once a year, so it's a day to dress for the occasion! 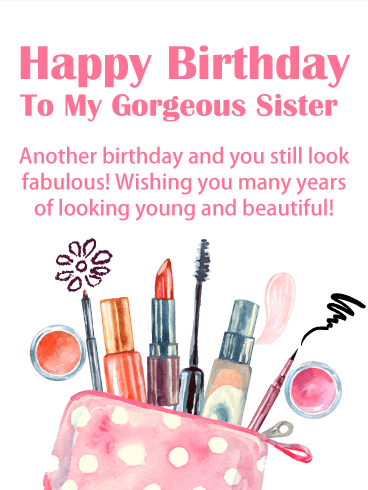 Pretty pink lipstick, eyeshadow, and other cosmetic items add a fashionable look to this upscale birthday card that your sister will appreciate! It's a great reminder that today is the day to go all out and look her best because her celebration is approaching! The creative Happy Birthday lettering only adds to the modern and fashionable look of this greeting card, making it a must send! Don't delay, send this birthday card on its way! 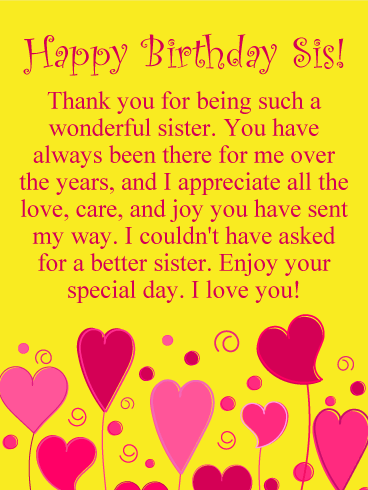 Surprise your sister with this awesome birthday card that will fill her day with joy! It features a pretty car made of flowers that is carrying lots of birthday presents! A sight that will get your sister excited about the gifts she will receive for her birthday! The Happy Birthday lettering adds a fun look to this birthday card that your sister will love. 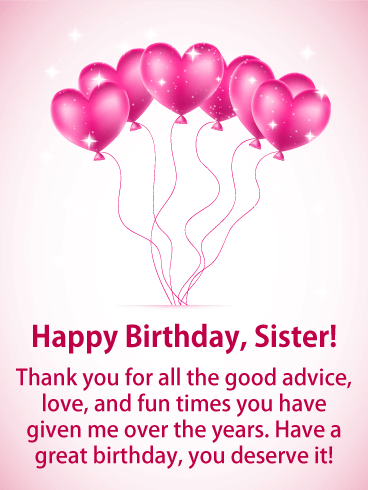 Send birthday wishes your sister's way and make sure to send it on her special day! Send your sweet sister the best cake ever on her special day with this terrific birthday card! You can even wish her a lovely day and a beautiful year at the same time. The fancy cake showcases little pink hearts, decorative blue stripes, and a lovely bow! 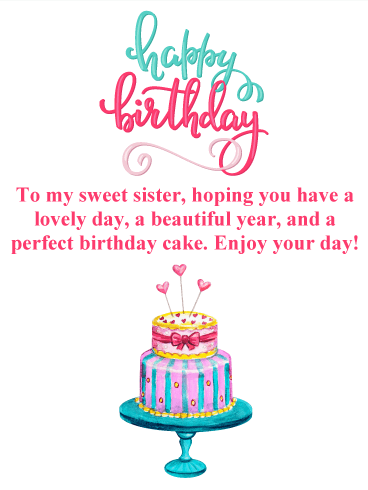 Your sister deserves the best so send this birthday card over to her right away so she can see her cake at the start of her special day! 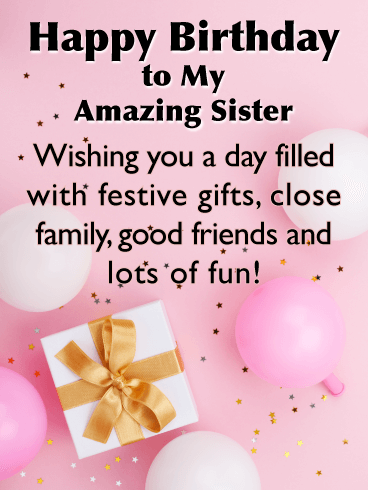 If you have one of those sisters who looks out for you with good advice, lots of love, and fun times, then sending this birthday card would be a terrific idea! It features perfect pink hearts that represent your love for your sister, and a message that will thank her for all that she has done for you over the years. 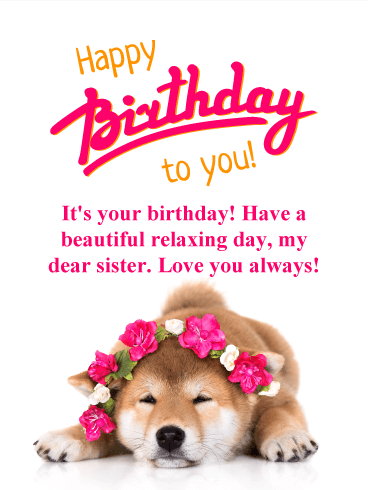 So wish your sister a great birthday with this fantastic birthday card today, she will thank you for it! 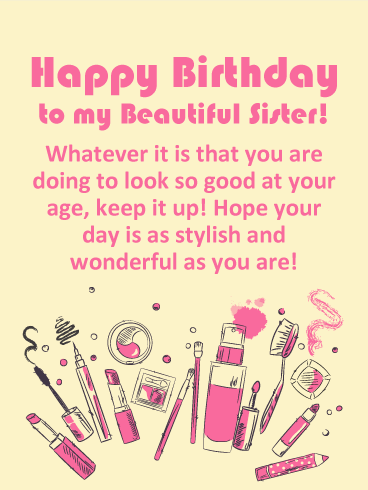 If you have noticed that your sister's cosmetics make her look gorgeous, then she will love receiving this birthday card. She will also appreciate that you took the time to choose a personalized birthday card just for her. In addition to this, your sister will especially like the fact that you think she looks young and fabulous. 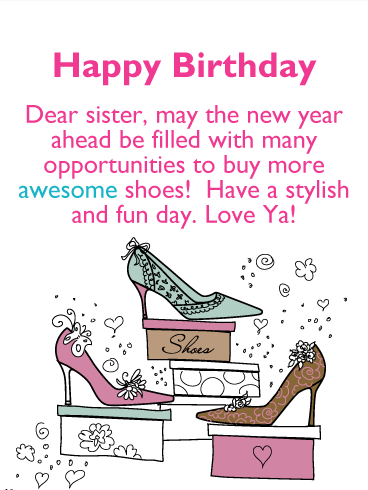 Get your sister's birthday started the right way with this fashionable birthday card! Who can resist stylish high heel shoes! 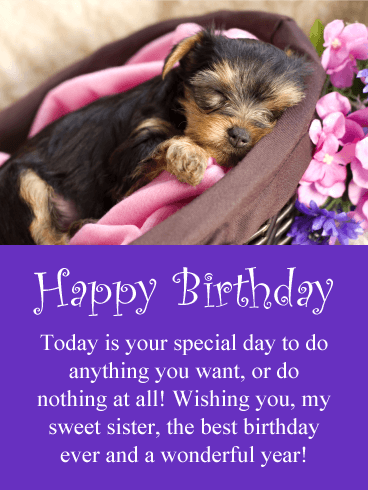 If your sister can't, then this birthday card will make her smile! The fun message wishes her a year of opportunities to buy more shoes! She will get a laugh out of this and will most likely hope it comes true! This birthday card features fabulous shoes. So pretty! 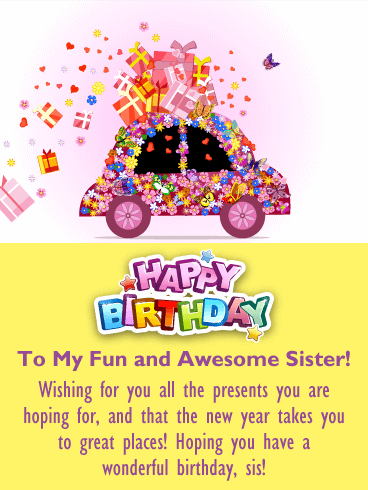 So take the right steps to make sure your sister has an awesome birthday by sending this greeting card out soon!